Feel the new endless offroad adventure starting! Feel Real Ultra graphics and Physics. 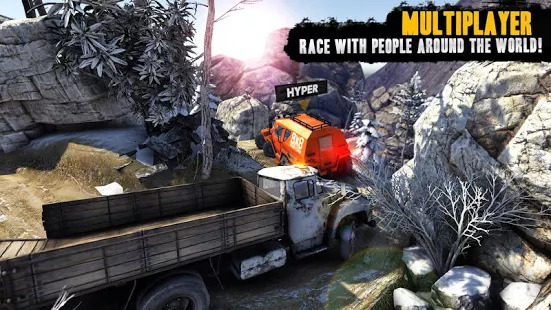 One of the best free truck racing game on The Android. First version of TruckDriver:Offroad series was downloaded by *30 Million* people all around the world. Longing is over! TruckDriver:Offroad is with you with the new version! New Physics Engine: You will feel closest to real simulation in top level with improved physical engine. •Unrivaled New Style: Along with new and endless story mode, unique and different 8 atmosphere is waiting to be discovered. Adventure is waiting for you in real weather conditions are fully reflected to your vehicle with all its feeling. •Here are Field Monsters: 7 different types of vehicles, that are superior between each other, have specific power system, suspension structures, traction types. •4 Different Game Modes: Excitement awaits you in all kinds with Career, Time Challenge, Free Mode and Multiplayer. Experience 3 different game modes in top level with people you don’t know from all around the world, your friends and family or people around you that plays the game but you don’t know! • Finishing Race: Race with others with your current vehicle and earn bitcoins and purchase better vehicles. • Flag Race: It doesn’t matter either your speed or finishing first, it doesn’t mean anything if you don’t go to finish line without flag! Hit your rival and capture the flag and go! • Sky Derby: There is an arena and one salvation in the sky, send your opponent down from the sky and stay alive! •Find yourself rivals in close range with find people around me feature. You can deliver us all suggestions without hesitation. Your idea is important than anything! ENJOY WITH BEST TRUCK GAME !!! » Some major bugs fixed.